Unlike previous generations, millennials use technology far more often, and seem to be on their phones or laptops constantly. If you’ve ever seen a group of millennials out for drinks at the bar, it seems as if they spend more time interacting with their phones than with each other. For better or for worse, technology has impacted our lives in many ways. It’s brought us closer to loved ones around the world, made it easy to navigate and get directions in a strange city, and allow us to listen to our favorite music any time any place. 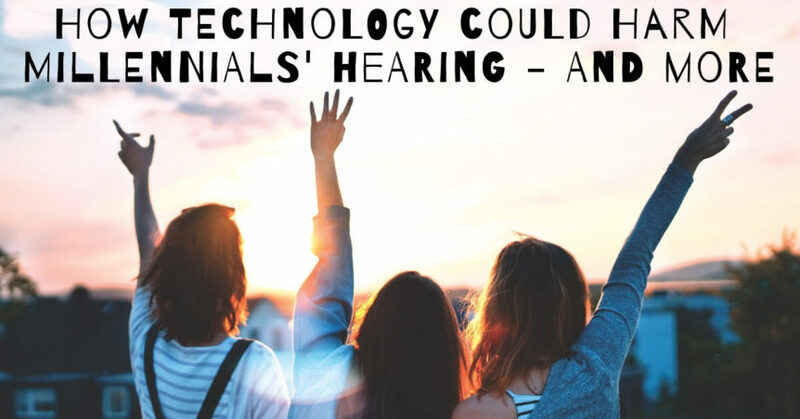 But technology could also be harming your hearing – and more. Can Technology Cause Hearing Loss? For the millennial generation, those born in the 1980s and 1990s, technology is a way of life. While many millennials don’t see any problems with their use of technology, experts warn that there could be some serious health effects to this heavy use of phones, computers, and other technology. One of the most obvious effects of technology is hearing loss. The Centers for Disease Control and Prevention states that hearing loss is the third most common chronic health condition in the US! For young adults and teens who are always listening to music with earbuds jammed in their ears, it’s no wonder that hearing loss could occur. Personal listening devices can be turned up to very dangerous volumes, and many people listen to their music for hours at a time without taking a break. A CDC study found that 8 million adults in their 20s have hearing loss, and an even higher number of people in their 30s struggle to hear. If someone near you can hear the music coming from your earbuds, your music is far too loud, and you need to turn it down to protect your hearing. It’s also a good idea to unplug every now and then, and give your ears a break. This will protect you from damaging your hearing. Another way to prevent hearing loss is by wearing appropriate hearing protection. If you work on a noisy jobsite, or enjoy attending loud concerts or sports events, make sure you’re wearing earplugs or hearing protection so that you won’t risk developing tinnitus or hearing loss. You’d think that all our new ways of connecting would make us happier, but in reality it seems that connectivity has actually made us less social. There is a link between technology and social anxiety, and when it becomes more comfortable to send someone a text than to meet in person, you know that technology has had a major impact on how we relate to others. If you’re not meeting friends as often as you used to, or developing and maintaining your close relationships, you risk social isolation, anxiety, and depression, all of which are found at higher rates among millennials and younger generations. A recent study by the Blue Cross Blue Shield Association supports found a 47% increase in millennials suffering from depression, based on data from 2013 and 2016. There are also higher rates of attention deficit hyperactivity disorders, or ADHD, among millennials. Many experts postulate that this is due to the overstimulation of constant technology use. TV, cellphones, and computers could be to blame for why children and young people have a difficult time focusing on tasks at school, at work, or at home. Anyone who uses technology throughout the day tends to be less active, and lead a more sedentary lifestyle. Millennials risk higher rates of obesity, high blood pressure, high cholesterol, diabetes, and heart diseases than older generations. Not only are activity levels affected, but millennials tend to have worse posture, and often develop neck or back issues from spending many hours of every day hunched over computer or phone screens. If you’re a millennial struggling with hearing loss, take a moment to unplug, and think about your hearing health and your overall health. Is your use of technology harming your hearing and more? If you’re straining to hear, visit us today at Neighborhood Hearing Aid Center and find out how a hearing device can help you connect to the world around you in a whole new way.